I finished it in time! For the back I used the block I messed up as well as a big block made of solids that I used in my grandfather's quilt. Yes, I am going to finish that one. I'm just at a quilting inspiration standstill. 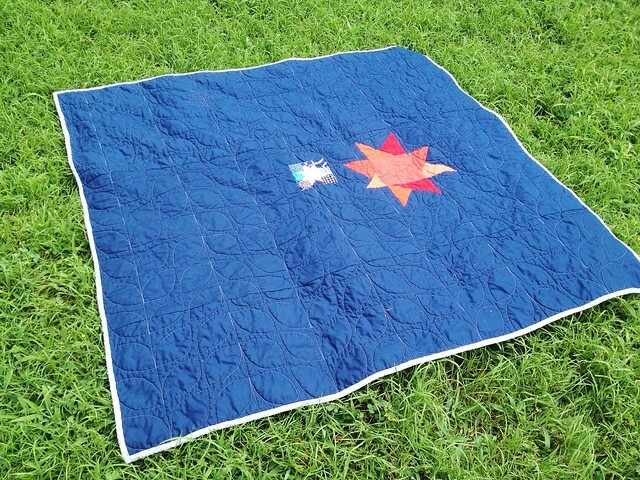 I took this quilt outside to photograph for the first time, and I really like how that came out. The grass was a little dewy, and one of the pictures is sunny and the other darker because I didn't think to wait for the cloud to pass. Live and learn! 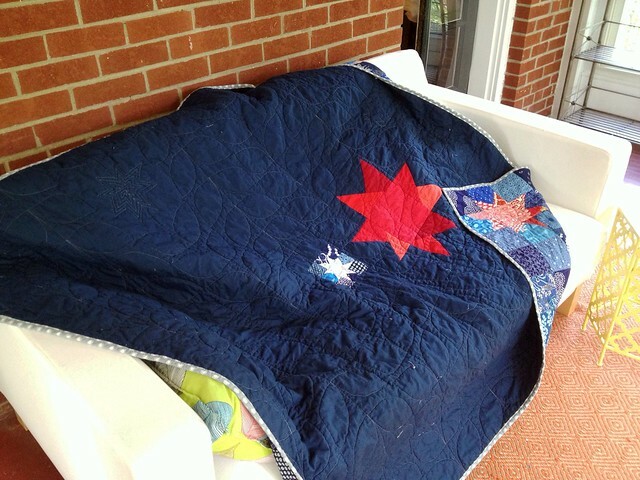 I free motion quilted it with little sprouts that go in alternating directions, and echo quilted the gray stars for interest. 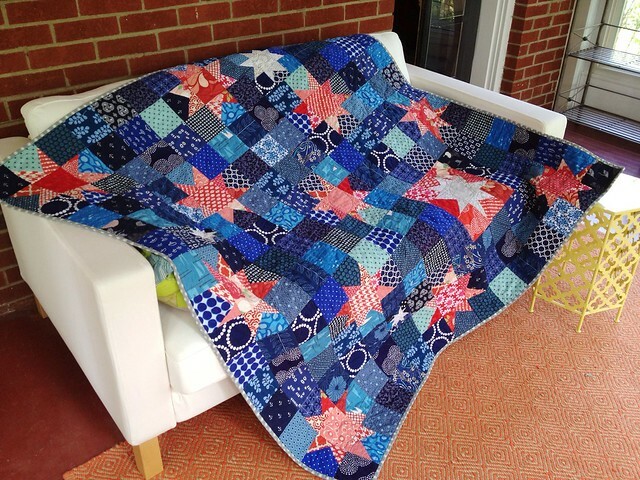 I had been thinking about how to quilt this, and then saw this post on Julie's blog that SAME DAY. Perfection! I bound it in a Denyse Schmidt print that went with it perfectly. It finished at 60x60, and I used ~30 blue prints, I think 17 pink/red prints, and about 10 gray prints. They were almost all from stash, except some of the reds, because I don't work with red very often, and don't keep it stocked. Love it to bits! Great name too! Wow! Fast finish and a wonderful quilt. Lovely finish, Megan! The quilting is awesome and the dotty binding.... Perfect! Hope you don't mind... I am sharing this on my facebook page with a link back at http://facebook.com/sewfreshquilts Let me know if you would prefer I didn't! Looks awesome! 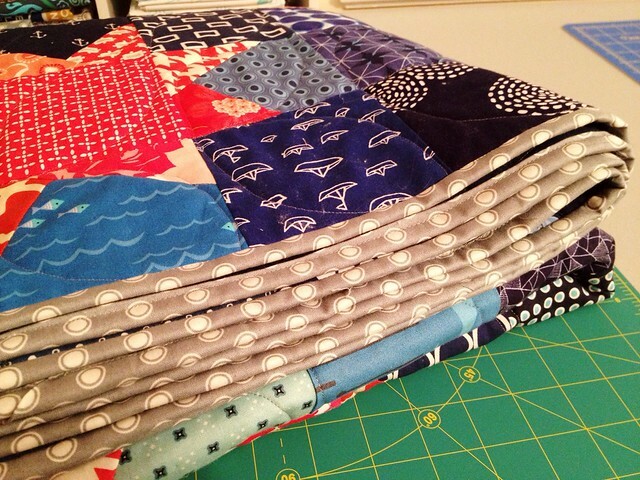 Your quilting is perfect and you can never go wrong with a DS print for binding! This turned out so beautiful - fantastic job!! Gorgeous! Love the blue and red classic combo! I'm stopping in from Plum and June. Love the stars - you sure are quick! Seriously fabulous. 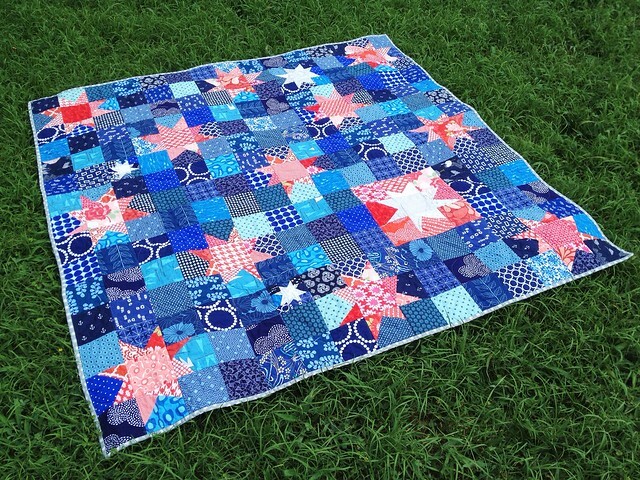 I love a wonky star and you took the pattern to a new scrappy high. Congrats on a great finish. Very pretty, your Grandmother is going to love it. Quilts are the best medicine!